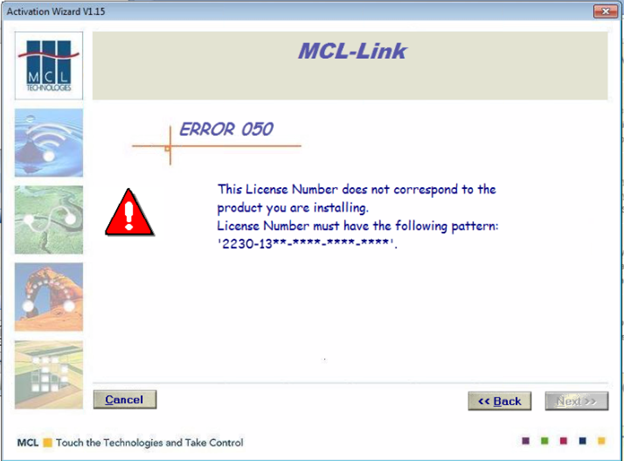 This Error Message Article explains the MCL Link error message “Error 050 This License Number does not correspond to the product you are installing. License Number must have the following pattern: ‘2230-13**-****-****-****’.” and details how to fix the underlying problem that caused it to appear. The license you are trying to activate does not match the installed software. MCL has different licenses for different editions of the same software. Some are specifically branded for PDT’s from one manufacture and others are generic. The ones that are specifically branded must be purchased from the hardware manufacturer and have their own license number format. In this situation, a license purchased from a hardware manufacturer did not work for a different PDT. The MCL license purchased must match the software installed. Get a new license or install the MCL plug-in software that matches the license you own. Error Message First Seen: Windows 2008 and Windows 2012 running MCL v3.